Poet and activist Lebohang Masango was also announced as UNICEF’s newest Volunteers Advocate. 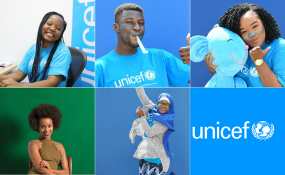 The appointment – marked on World Children’s Day at Constitution Hill – makes the 28 year-old UNICEF’s sixth celebrity supporter in South Africa. Lebohang Masango is the author of children’s book, Mpumi’s Magic Beads, which is available in all of South Africa’s official languages. She is currently one of the 25 young women from Southern Africa selected to be part of the inaugural Zanele Mbeki Fellowship in feminist leadership. She has also been identified by the Bill and Melinda Gates Foundation as a #Goalkeeper, one of the young people working to realise the United Nation’s Sustainable Development Goals (SDGs). In her role as UNICEF South Africa’s Volunteers Advocate, Lebohang Masango will use her voice to make UNICEF an even more powerful force for children by bringing people into the organization, working hand-in-hand, supporting children with their time, voices and fundraising efforts. She joins a list of UNICEF South Africa Ambassadors and Advocates including: Jo-Ann Strauss, Gavin Rajah, Zakes Bantwini, Tshedi Mholo, and Carol Bouwer. To help give a voice to the millions of children whose voices remain unheard, high profile stars in South Africa and corporate leaders are lending their support to the initiative. UNICEF partners Ster Kinekor, the SABC Foundation, Mango Airlines and Nedbank are demonstrating their support by live-screening the official UNICEF ‘World Children’s Day’ video in cinemas, national TV channels, banks and on flights across the country and the region. As part of the day’s activation, Destiny Magazine hosted a Facebook live ‘Blue Carpet’ talk show. The talk show event featured students from various schools in Johannesburg to discuss their views and experiences with bullying and violence in school.